This post is sponsored by SheSpeaks and Walmart . All opinions expressed are my own. The weather is gradually starting to change around here, which has many of us getting down to the business of spring cleaning our homes. This year, I'm trying to be super intentional about DEEP cleaning each room in our home, before the summer arrives. While this is a task that I take on every year, with a baby on the way, I definitely want to make sure that everything is as clean and organized as it possibly can be. When planning a BIG seasonal cleaning project like this, I make a game plan, shop for the necessary supplies, and tackle each room in our home, one by one. There's no doubt about it; a project like this takes a ton of time and effort! So, I definitely want to make sure that I get it done right the first time around! 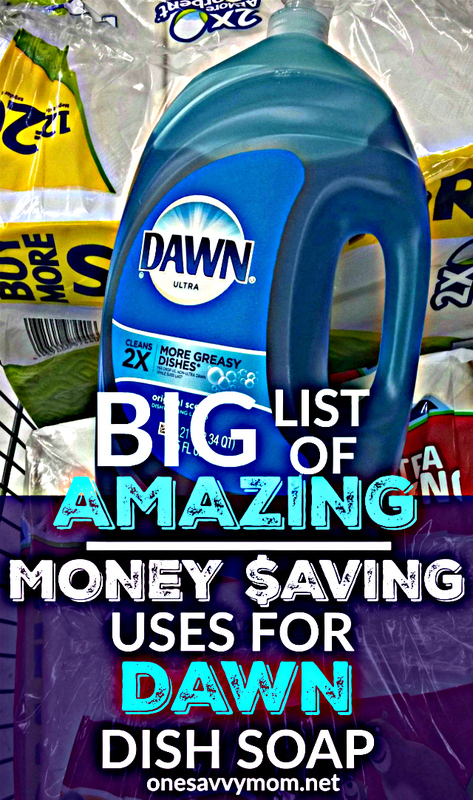 Check out my quick and simple spring cleaning tips, money saving offers, AND my list of AMAZING money saving uses for Dawn dish soap below. Seriously friends, some of them are complete game changers. Dawn has SO many uses! Like I mentioned, I'm a planner when it comes to big seasonal cleaning projects. I start by making a list of all of the essentials that we'll need to clean, then I head to the store. Can I tell you all a secret? I'm a bit of a stock-piler, especially when it comes to certain items. I have a big family, and stocking up on household essentials that I'll need for an entire season, such as dish soap, shampoo, tooth paste, paper towels and toilet paper - not only puts my mind at ease, but it also saves me money AND from running to the store each week! Plus, if I see a great deal, it only makes sense to stock up and save while the prices are great, and get on to other things, like having fun with my family! This year, I hit my local Walmart to take advantage of their Stock Up and Save event. I got great deals on everyday essentials that we use a TON of in our home, and I saved BIG! Not only will I be able to get a jump on my Spring cleaning project / mini-overhaul, but I'm also set for the summer season, which takes a big weight off! 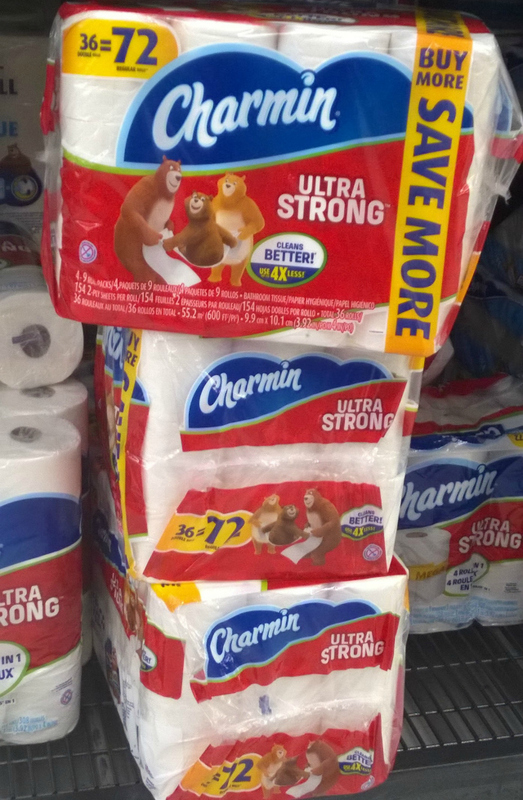 I grabbed great deals on Bounty Paper Towels, Charmin Toilet Paper, Dawn, and Crest. Now that you know my secret about stockpiling. Can I tell you another little secret? ... 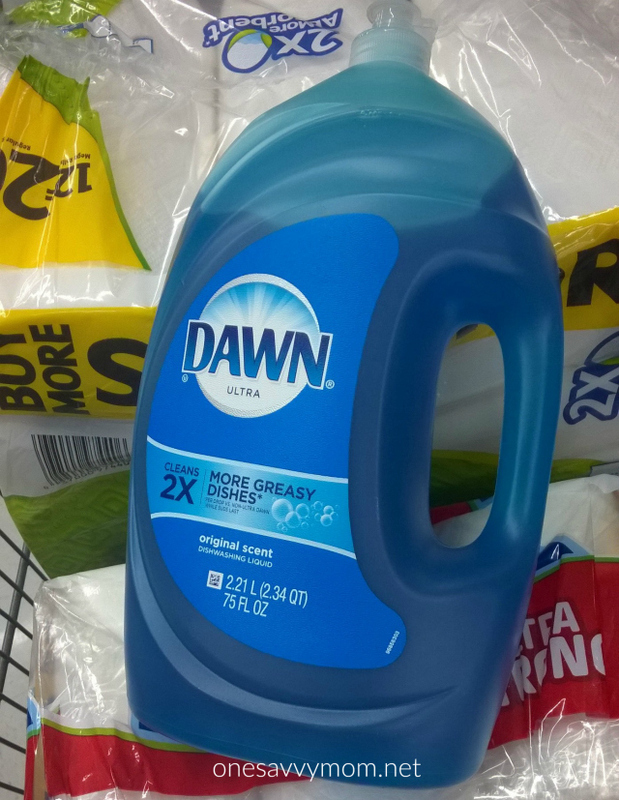 I use Dawn to tackle a variety of household tasks; not just the dirty dishes! It's seriously AMAZING, and it has so many money saving uses! Here are some great uses for Dawn that will help you tackle some of that spring cleaning this year, and a TON of other tasks around the house! To do the dishes: This one is pretty obvious. But Dawn really does do such an amazing job at degreasing! It leaves the dishes so sparkly and clean. Tackle Clothing Stains: Stains on your favorite shirt? Dawn will make em' disappear! Simply pretreat the stain with a dab of Dawn and wash the clothing as you regularly would. I keep a small bottle of Dawn next to my washing machine, at all times. Lift makeup stains from clothing: We've all been there! When you get a dot (or more) of foundation / makeup on your clothing,simply use Dawn to lift the makeup from the fabric. Start by placing a paper towel under the fabric where the stain is located, and dab the stain on the surface of the fabric using a bit of dawn, warm water, and a paper towel. It lifts the makeup from your clothing like magic! BUBBLES! : Dawn Makes the BEST Bubbles for bubble makers! Mix (gently so that you don't create a ton of foam on the surface) 1/2 Gallon Warm Water, 1/2 Cup Dawn Ultra, and 1 tablespoon glycerin. If you do generate foam while mixing the bubble solution, simply skim the foam off the top prior to use. Repel insects from houseplants: Put a drop of Dawn in a 16 oz. spray bottle, fill the rest of the bottle with water, and shake gently. Mist household plants with the mixture once a month. Wash your windows: Mix 3 drops of Dawn with 1 gallon of water. Pour the mixture in a spray bottle, and wash / dry your windows as you would with any other window cleaner. This solution makes them really sparkle for mere pennies! Wash your pets: It is gentle and effective when used as a pet shampoo, and kills fleas on contact. Make an ice pack: Fill a zip sandwich bag half way with Dawn and place it in the freezer. It can be re-used multiple times, and it's flexible / more comfortable to use than a rigid / solid ice pack. Homemade Tub/ Shower Cleaner: Fill a 16 oz. spray bottle halfway with vinegar, heat it in the microwave for 45 seconds. Fill the rest of the spray bottle with Dawn. Replace the spray lid on the bottle, and shake vigorously. Spray the mixture in the tub, and on the shower walls. Allow it to sit for 10 minutes, and rinse with warm water. It will completely melt away all of the soap buildup / any shower rings. No scrubbing required! Poison Ivy: Poison Ivy spreads via the oil from the plant. Dawn effectively cuts through / washes away the oil and helps prevent the spread of the rash/blister causing oil from the poison ivy plant, on the skin. Remove paint / grease from hands: Mix a tablespoon of Dawn with a tablespoon of corn oil. Rub the mixture in your hands for a minute or two, just as your would normally wash your hands. Rinse under warm water. Lift fatty/oily stains from clothing: Grease can be a pain to get out of clothing / fabric - simply use a dot of Dawn to pre-treat the grease stain and wash as normal. Dawn cuts through the grease - even in fabric! Squeaky hinges: Dawn works well as a non-toxic lubricant on squeaky hinges. Simply add a dot or two to the hinge, and move the hinge a few times to work the Dawn into the hinge. Clean greasy tools: Let tools soak in a warm water / Dawn mixture (about a gallon of warm water and 1 tablespoon of Dawn). Rinse them clean, and dry them before putting them away. As a bonus, Dawn also helps to prevent rust on tools. Tools are pricey - protect your investment! Clean hair product residue/ product build up from hair: Use Dawn as you would shampoo, once a month, to remove residue/buildup from hair products from your hair. Manicure perfection: Soak your hands in warm water and a drop or two of Dawn, it softens cuticles and removes oils from your hands for better polish application. Clean your makeup brushes and makeup sponges: Add 2 drops of Dawn into 6 cups of warm water. Dip your makeup brushes / sponges in the mixture, and rinse clean with warm water. Repeat every four weeks or so. Cleaning your brushes / sponges is great for your complexion, and your wallet! By caring for these items well, you won't have to replace them nearly as often. Care for oily skin: Use a small dot of Dawn and warm water to wash away excess oils from your face. Clean Paintbrushes: Soak paintbrushes in a mixture of 3 cups warm water and 2 tablespoons Dawn soap for 1 hour, to strip paint from the brushes. Rinse clean with warm water. Good as new! Wash your car: Wash your car using a small amount of dawn in warm water, and a clean sponge. It's great at removing oil and gunk buildup from your wheels too! Make sure to rinse well to remove all of the soap. De-clog your kitchen sink: Add 1 cup of Dawn soap to the drain. Allow it to sit for 20 minutes. Then flush the drain with 1 gallon hot water to open the drain! Hostess Gift: Print off a copy of my FREE printable gift tag below! 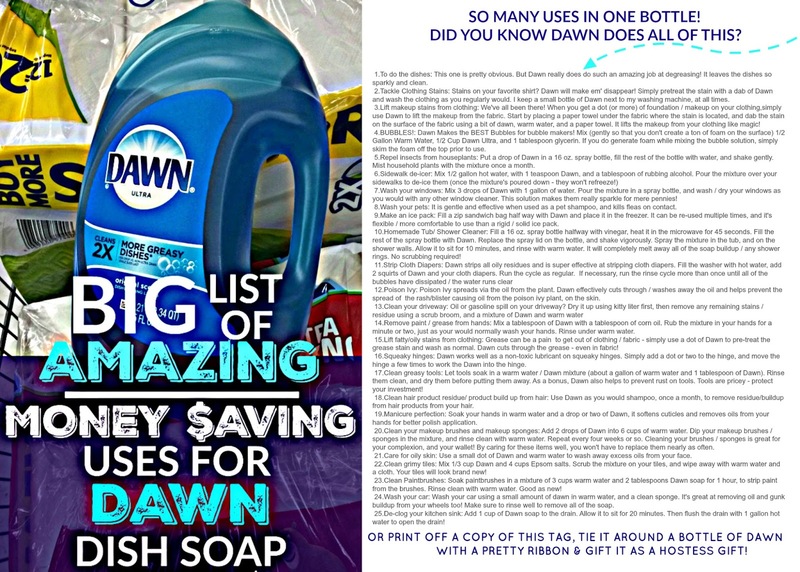 It lists all of the AMAZING uses for Dawn listed in this post, punch a hole in the corner of the printout, tie it around a bottle of Dawn with a pretty ribbon and gift it as a hostess gift! (INSTRUCTIONS TO PRINT: Click on the image below to enlarge it to it's original size. Next, right click on the image and select to save or print. The image is sized / intended to be printed in a 5 x 7 format). I told you it has a TON of uses, didn't I?! Seriously, make sure to grab yourself a bottle (or three) at Walmart's Stock Up and Save event (going on throughout the month of April)! You (and your wallet) will be so glad you did! Looking to sweeten the already great deals a little more, during the Stock Up and Save Event? Beginning April 11th (2016) you can check out additional rewards from P&G on the Ibotta App! AND because I know we all get busy, and at times forget! Get up-to-the-minute informational updates throughout the month / "attend" the April Stock Up & Save Event on Facebook. Now, are you ready for some spring cleaning, and to put some of those AMAZING uses for Dawn to task? 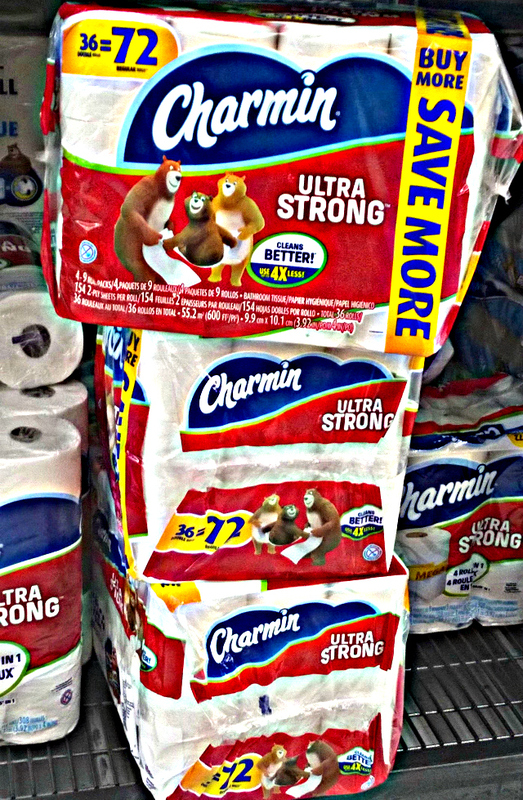 Stock Up & Save on essentials in-store at Walmart locations nationwide, or by heading to www.stockupsave.com, throughout the entire month of April! Now, I've told you my cleaning and money saving secrets. Ready to share too? Tell me (in a comment below OR [tag me on Twitter @one_savvymom) how do YOU save time and money on cleaning supplies and essentials for your home? I'm always on the lookout for great new tips and advice! Happy spring and happy spring cleaning, everyone! I'm saving this list for sure! I already use Dawn for quite a few things, but this is a great list. I like Dawn dishwashing liquid and Charmin bath tissue. I did not know that I can use Dawn for all of these Spring Cleaning tasks. I will have to try out some of them! There are some really amazing ideas on this list. I will have to be purchasing Dawn in the future.